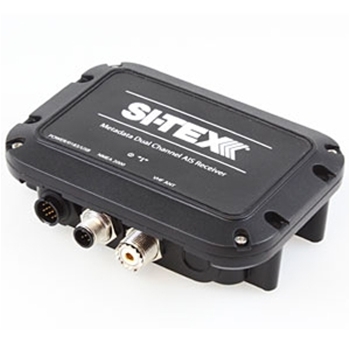 The Si-Tex MDA-2 is a Dual Channel AIS Receiver. NMEA0183, NMEA2000 and USB Connectivity this AIS Receiver. 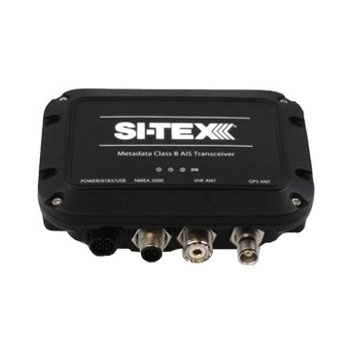 The MDA-5 from Si-Tex is a fully certified 5W AIS transceiver. Higher wattage allows communications to reach further while the included SOTDMA Class A Priorities ensures your vessel will always transmit and be seen even in very congested areas where normal Class B transceivers wouldn’t normally have network priority. 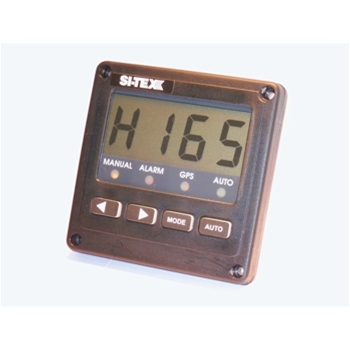 The Sitex SST-110 Sea Surface Temerature Gauge provides accurate readings to 00.01 degree fahrenheit. Packaged with a transom mount transducer, the SST-110TM is perfect for any sized outboard powered vessel. The Si-Tex SVS-760C with external 50-Channel GPS receiver provides quick and accurate position shown on the bright 7” Display. With the ability to save up to 20,000 Waypoints and 100 Routes, the SVS760C is perfect for small commercial boats or serious fisherman. Included Navionics+ charting. 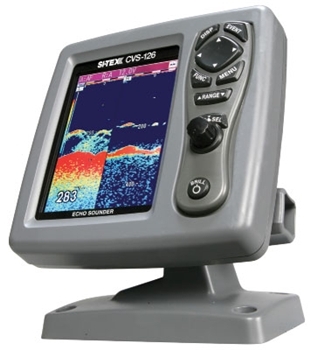 The Sitex CVS 126 is a powerful 600 watt fishfinder featuring a dual frequency 50/200 kHz operation. 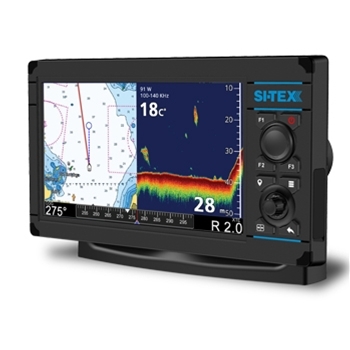 With digital signal processing and Sona-Tone the Sitex 126 will help you catch fish. 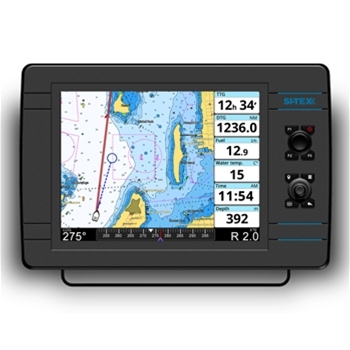 The Sitex Trawl Plot 12SD is a work horse chartplotter built for the commercial marine industry. Beyond the large 12.1” color LCD display is unlimited waypoint and track storage using removable SD cards. If that was not enough you can even add sonar, radar and AIS. The Sitex SP110VF-2 Autopilot is an ideal high performance autopilot for small to medium sized power boats whether inboard or outboard. With virtual feedback, the SP110VF2 eliminates a rudder feedback and enhances the pilots performance. 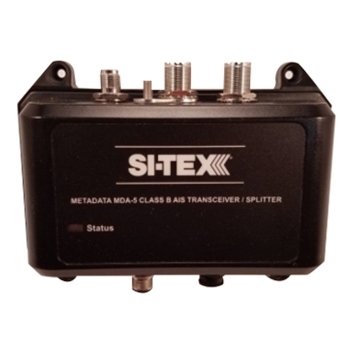 Si-Tex MDA-1 Metadata-Class B AIS Transceiver with internal GPS 50 channel Smart Receiver will provide maximum range and exceptionally efficient real time AIS message processing for all AIS messages. 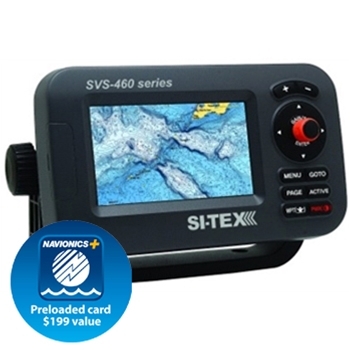 Sitex’s SVS-760CF with external 50-Channel GPS Antenna finds and locks onto position quickly and efficiently while the powerful 600W echo sounder enhances bottom composition and contour as well as fish targets beneath your boat. 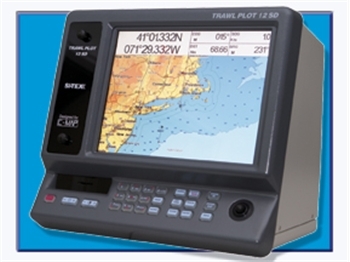 Includes Navionics+ Charting. 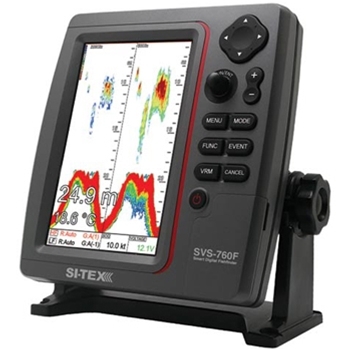 The Si-Tex SVS-760F is a powerful 600W Dual Frequency Fishfinder. A Bright Color, Sunlight Viewable 7.5” Display enhances bottom composition and clearly displays fish targets below your boat. Rugged and Waterproof to IPX7 Standards. Transducer Required and Sold Separately. 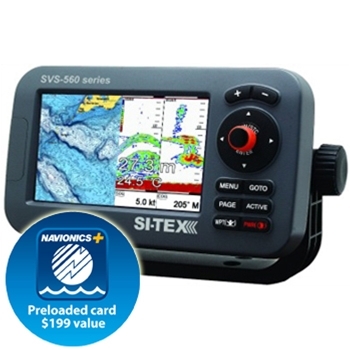 Sitex’s SVS-460CE with included Navionics+ Charting for all of North America provides exceptional performance without the high end price tag. Rugged and designed to withstand the elements this bright 4.3” color display includes an external antenna, Dual Charting options and LED backlighting. 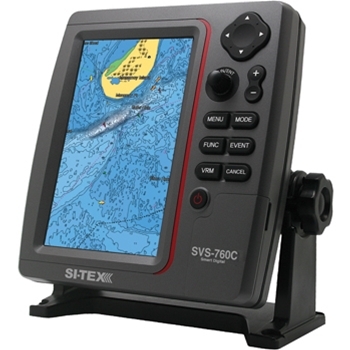 Si-Tex’s SVS-560CF is a 5” combination Chartplotter / Fishfinder preloaded with Navionics+ North American Mapping. C-Map Compatible, the SVS-560 offers a bright, sunlight viewable display with Rugged Waterproof construction, Internal GPS Receiver and 600W Dual-Frequency Fishfinder. 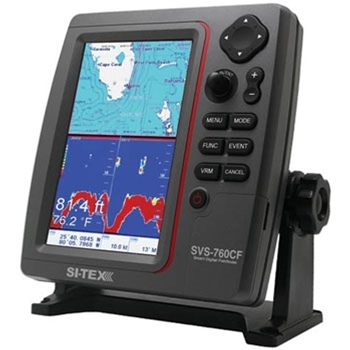 Si-Tex’s SVS-560 CFE is a combination Chartplotter / Fishfinder offering a bright, 5” sunlight viewable display with Rugged Waterproof construction. Navionics Nav+ Mapping and built in 600W Dual-Frequency Fishfinder. The SVS-560CFE includes an external antenna for quick and accurate satellite acquisition. Bright 10.1” Display! 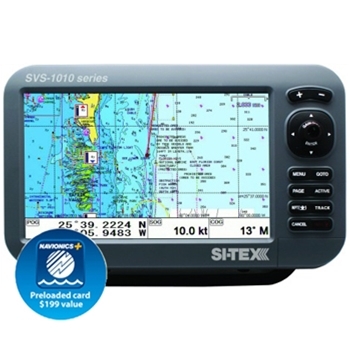 Si-Tex’s SVS-1010C Chartplotter with 52 Channel Internal GPS Receiver provides a quick and accurate satellite position and shows your boat moving fluidly onscreen on the included Navionics+ Mapping. Rugged and Waterproof, the SVS-1010 can withstand even the harshest environments. Exceptional Value and Performance. 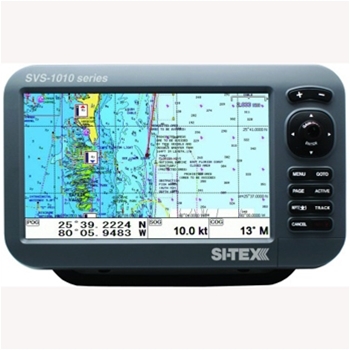 Si-Tex’s SVS-1010CE Chartplotter with External GPS Receiver offers Dual-Fuel Charting. Preloaded with Navionics+ Mapping the SVS-1010 can also accept CMAP Cartography. 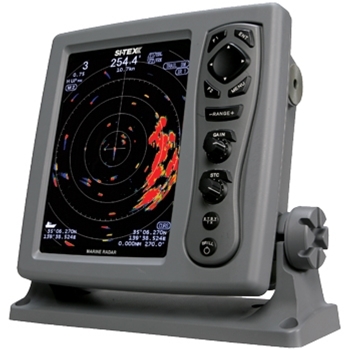 Designed for use on nearly every vessel whether recreational or commercial this 10.1” Color display provides exceptional performance at an affordable price. 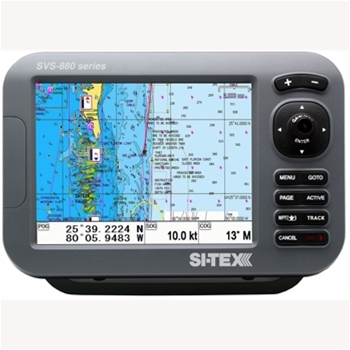 Si-Tex’s SVS460 is an affordable Chartplotter solution when space is limited. A bright 4.3” Color display with included Navionics+ Mapping, “Dual-Fuel” Charting enabling the uses of C-MAP cartography, keypad and rotary knob controls and Internal GPS Receiver. Rugged and Waterproof. 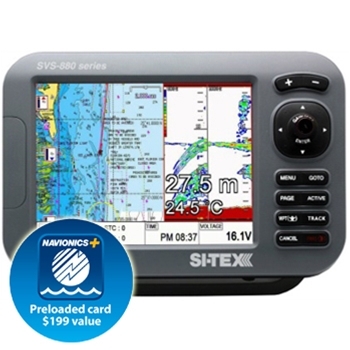 The Sitex 880C with 52 Channel Internal GPS receiver and Navionics+ Mapping offers a 8” High Resolution Color LCD Display and is a powerful standalone Chartlotter perfect for all boats from smaller skiffs all the way up to larger commercial vessels. Simple operation, Rugged and Waterproof to IPX7 Standards. 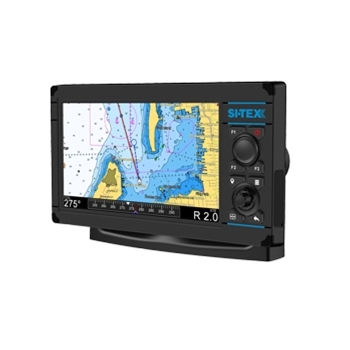 The Sitex 880C Chartplotter with External GPS receiver and Navionics Nav + Mapping offers a 8” High Resolution Color LCD Display and is a powerful standalone Chartlotter perfect for all boats from smaller skiffs all the way up to larger commercial vessels. Simple operation, Rugged and Waterproof to IPX7 Standards. 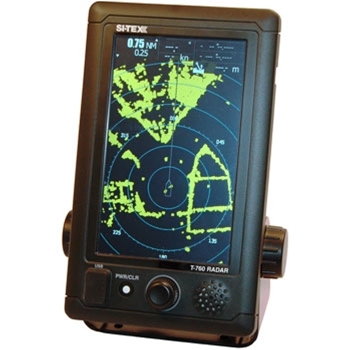 The Si-Tex T-2040-3 Radar provides 4kW of power, a 3.5’ Open Array Antenna reaching 48 nautical miles and paired with a 10.4 Color TFT LCD Display. 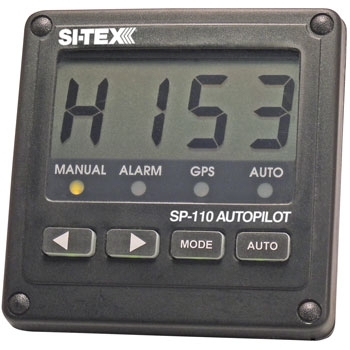 With a Si-Tex SP110 you get an easy to operate and reliable Autopilot for your inboard powered vessel. Designed for boats with hydraulic steering cylinders up to 9ci. The Explorer NavPro Charting System from Si-Tex is a Black Box System that can turn any VGA Display or PC Monitor into a full C-Map Charting System. Includes Wifi connectivity, NMEA 0183 and NMEA 2000 Ports and comes packaged with External GPS Smart Antenna. The NavStar 10 from SiTex builds on their line of Mutli-Function displays with this 10” hybrid-touch. 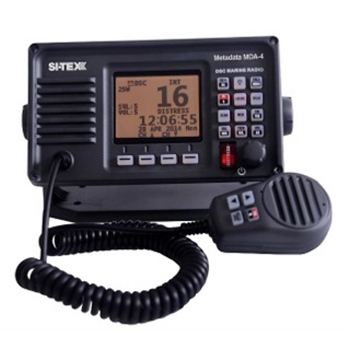 Designed with the durability and reliability that SiTex is known for, this powerful combination unit includes a 1kW sonar and radar capability. Order Now Through April 30th, 2019 and get a $200 Mail-In Rebate From Si-Tex! 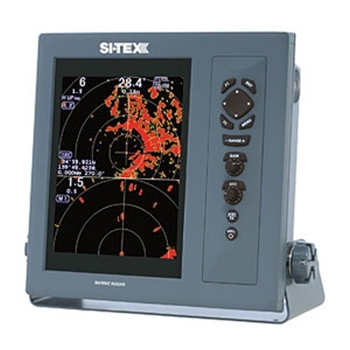 The NavStar 12 from SiTex builds on their line of Multi-Function displays with this 12.1” hybrid-touch. 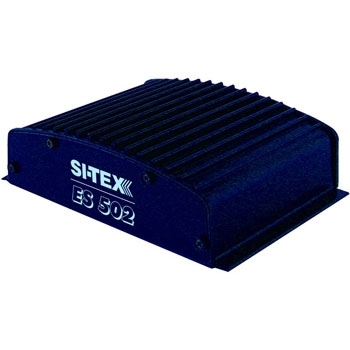 Designed with the durability and reliability that SiTex is known for, this powerful combination unit includes a 1kW sonar and radar capability. 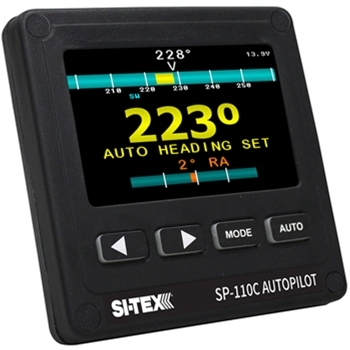 The Sitex SP110CVF-2 Autopilot comes with a bright color display and is an ideal high performance autopilot for small to medium sized power boats, inboard or outboard. With virtual feedback, the SP110VF2 eliminates a rudder feedback. 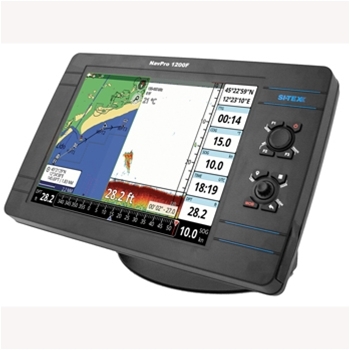 The Si-Tex NavPro 900F Chartplotter Sounder will wow you with its capabilities and ease of use. Behind the bright 9” touch screen is a 600w or 1000w sounder, a C-Map 4D compatible chartplotter and more features than you will probably ever use. 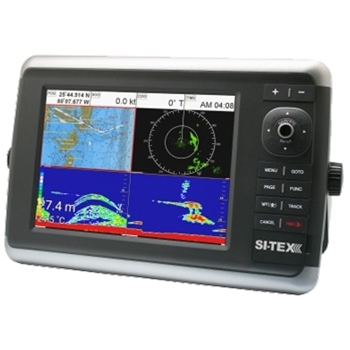 The Si-Tex NavPro 900 provides the user with a plethora of features like Wi-Fi, Automatic Updates, Cloud Backups and C-Map 4D coverage for the US Coast and Rivers. All behind a bright hi-res 9” touchscreen display. 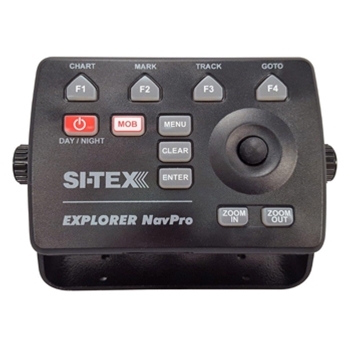 The Si-Tex NavPro 1200 provides the user with a plethora of features like Wi-Fi, Automatic Updates, Cloud Backups and C-Map 4D coverage for the US Coast and Rivers. All behind a bright hi-res 12” touchscreen display. 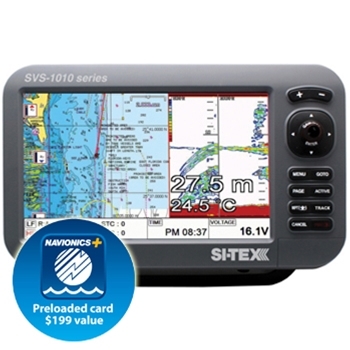 The Si-Tex NavPro 1200F Chartplotter Sounder will wow you with its capabilities and ease of use. Behind the bright 12” touch screen is a 600w or 1000w sounder, a C-Map 4D compatible chartplotter and more features than you will probably ever use.